1. Improve my health: lose weight, exercise more, eat healthier, improve my health, stop smoking, stop drinking. 2. Improve my life: get a better job, manage my personal finances better, grow/improve as an individual, go back to school, enjoy life, travel, get a new house. 3. Improve my behavior: be a better person, use my time better, set goals, spend more time with family, be kinder to others, get involved politically, worry less. 4. Get closer to God. Fewer than half of those who make New Year’s resolutions are successful at keeping them for at least six months. The high failure rate has prompted a slew of columns and articles on New Year’s resolutions, with advice on whether or not to make them and how to keep them if you do. There’s little downside in resolving to improve your health, or improve your life, or improve your behavior. And it’s hard to argue against resolving to get closer to God. But there’s one resolution that, when you keep it – even imperfectly – helps you in all four areas. Regular Bible reading improves your health, improves your life, improves your behavior, and gets you closer to God. 1. Reading the Bible improves your health. It’s pretty obvious that reading the Bible improves your spiritual health. But what about your physical health? Your emotional health? According to the Mayo Clinic website, many physical and emotional health issues are the result of stress, which “can affect your body, your thoughts and feelings, and your behavior.” In fact, unchecked stress “can contribute to many health problems, such as high blood pressure, heart disease, obesity, and diabetes.” Common effects of stress on your body include chest pain, muscle pain, fatigue, and sleep problems. Stress can lead to emotional issues such as anger, depression, and anxiety. When you are stressed out, you may overeat (or undereat), smoke, abuse drugs or alcohol, and exercise less often. How does reading the Bible help you manage stress? Sometimes called “God’s love letter to us”, the Bible reminds you throughout that God created you in His image and loves you deeply, even when you wander away from Him. The Bible offers encouragement. Comfort. Reassurance. Strength. Peace. Hope. 2. Reading the Bible improves your life. Wisdom: The Bible is loaded with wisdom. Solomon, who prayed for wisdom and used it to lead Israel, provides a wealth of sage advice in several Old Testament books. The Gospels records the teachings of Jesus, whom even critics consider a teacher without equal. Commandments: The Old Testament includes the Law, much of which is commandments on living a life that is pleasing to God. Many of Jesus’s parables gave a fresh perspective on these commandments to counter false interpretations that had arisen over time. Rationale: In addition to providing sound rules for living, the Bible explains why God gave us these rules. Consequences: Why should you follow God’s instructions? The Bible is loaded with stories of people who did or didn’t and the consequences of their actions. 3. Reading the Bible improves your behavior. Regular Bible reading improves your behavior. In fact, scripture engagement – or the frequency with which you read your Bible – is a more reliable prediction of moral behavior than traditional measures of spirituality, such as church attendance and prayer. 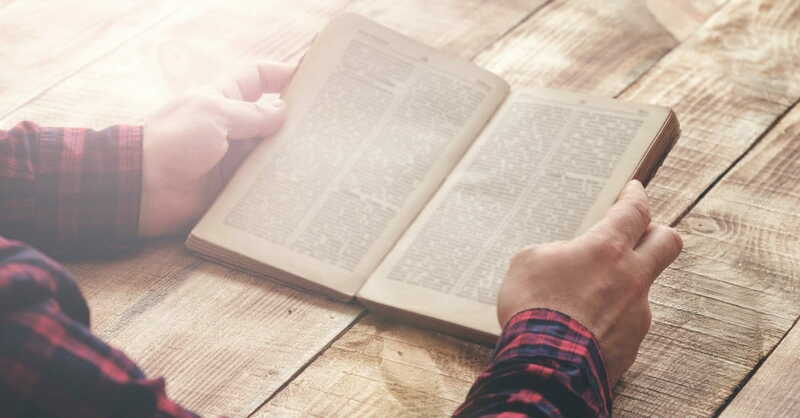 Reading your Bible more often not only makes you less likely to engage in risky behavior but also increases the likelihood that you will share your faith and disciple others. Christians who read their Bibles at least four days a week are more than two times (230%) more likely to share their faith and disciple others than Christians who read their Bibles less frequently. 4. Reading the Bible gets you closer to God. God reveals Himself to us in many ways, including the world around us. As Paul wrote, God’s “invisible attributes, namely, his eternal power and divine nature, have been clearly perceived, ever since the creation of the world, in the things that have been made” (Romans 1:20, ESV). But the primary way that God reveals Himself to us is through the Bible. The Old Testament shows us that God created us in His image, loves us, and, even though we rebelled – and continue to rebel – against Him, wants us to be reconciled to Him. Time and time again in the Old Testament, God demonstrates that he is patient with us and faithful in keeping His many promises to us. The New Testament tells the story of Jesus and the early days of the Christian church. At the beginning and end of his gospel, the disciple John explains why the New Testament was written. He describes Jesus as the Word of God, who “became flesh and dwelt among us” (John 1:14, ESV). John and the other New Testament writers recorded some of what Jesus said and did so that, in reading it, “you may believe that Jesus is the Christ, the Son of God, and that by believing you may have life in his name” (John 20:31, ESV). The more you read the Bible, the better you get to know God. The better you know God, the more you want to communicate with Him and follow Him. It's the best resolution…any time. The fact that reading the Bible regularly can have such a positive impact on us shouldn’t surprise us. After all, God’s Word is described as “living and active” and sharp enough to “divid[e] soul and spirit, joints and marrow” (Hebrews 4:12, NIV). James says that “the implanted word” can “save your souls” (James 1:21, NIV), and God says in Isaiah that His Word “will not return to me empty, but will accomplish what I desire and achieve the purpose for which I sent it” (Isaiah 55:11, NIV). As you head into 2019, resolve to read your Bible more often. It’s the best resolution to make, any time of year. And it’s never too late to start a resolution. Chris Bolinger is the author of Daily Strength for Men, published by BroadStreet Publishing and available at Amazon, Barnes & Noble, Christian Book Distributors, and DailyStrengthForMen.com. For more on making the right resolution, in late December or anytime, visit StartAResolution.us.